In The Bolt Test: Modern’s High-Water Mark, I revisited an old Mike Flores article on toughness. Flores claimed a format was often defined by the amount of damage its red removal spell dealt. Burn spells generally serve as some of the most efficient—and versatile—removal spells in a given card pool, for their cheap costs and ability to go to the head; as such, it makes sense that formats would revolve around them. But today’s Modern revolves as much around its other notorious removal spells. Now many months into the emergence of Fatal Push on the scene, I felt it was time to re-evaluate Modern’s removal spells, examining where they’re played, what they do, and the effects they have on the format. So, I checked the most played removal spells in Modern on MTGGoldfish and compared them to a slew of successful decklists from the Star City Games database. This article explains my takeaways regarding Modern’s three defining removal spells: Lightning Bolt, Path to Exile, and Fatal Push. The first big takeaway from my data collection process (which involved very scientifically looking over recent event results and identifying which decks played which removal spells): Bolt sees play in as many top-tier decks as Path does, despite being a full 12% further down the representation list. The probable reason for Bolt’s appearance in so many decks is its versatility. I called out Bolt as one of Modern’s deftest role-players in Modern Top 5: Utility Cards, but reducing Bolt to a mere “utility spell” would have been unthinkable in the format’s early days. Still, it’s the card’s undeniable utility that guarantees it so much action. Lightning Bolt serves two primary roles in Modern decks. The first is to remove early threats. This mode is employed by decks trying to survive the early game, either to shine in the midgame (Jeskai Control) or to execute a game-winning combo (Scapeshift). Decks have always played Bolt for this purpose, but those that ran it used to be even more diverse, pushing the card into the 40%-played range. These days, rock-style attrition decks have mostly transitioned away from red, and the combo decks that once relied on Bolt as early interaction now have Push to splash for (including some Scapeshift decks). As we’ve seen, though, quickly removing x/3s is not terribly important in this metagame, thanks in large part to Death’s Shadow. The card’s second mode is to just close out games. Players love to claim Bolt is weak against Shadow, but that’s like saying Blood Moon is weak against three-color midrange decks. Once Shadow decks see a red land, they’re forced to stay above 3 life, and ideally above 6. They’re also heavily incentivized to go below 10 life so Shadow itself resists Lightning Bolt. That greatly limits the plays Shadow decks can comfortably make by limiting the window in which they can deploy and benefit from their namesake threat. What players mean when they say Bolt is bad against Shadow is that it’s bad at one of its usual tasks: removing early threats. Shadow’s early threats do happen to resist the instant. But Bolt’s second mode of killing opponents is still live in the matchup, and becomes relevant much faster than it does elsewhere. I’m not saying Bolt is a fantastic card against Shadow; just that I’m not surprised the card is still a cornerstone of so many strategies even while the top decks—Shadow, Eldrazi, UW Control—blank its removal mode. The perennial gold standard for removal in Modern, Path to Exile is currently the format’s most-played card. So much for no white in the metagame! Fatal Push has changed Modern in multiple ways. The re-discovery of Death’s Shadow led to a midrange deck that wields Push expertly and gives it relevance in the mirror. Other decks have also turned to Push as a superb way to remove Death’s Shadow. All that Push has rendered Modern something of a hostile place for cheap creatures, opening the floodgates for delve creatures, Eldrazi, and Titans to pound through and dodge the removal spell. Enter Path to Exile, the only one-mana removal spell in Modern that removes all those threats. Path now is looking the best it has since Twin’s legality. The card’s role in Modern decks is the same as it always has been: remove a creature, no questions asked. But not many decks can run Path for the simple reason that splashing white is quite costly in Modern. Shadow’s brutal efficiency as a police deck forces strategies to become as focused as possible; otherwise, the one-two-three punch of Inquisition of Kozilek into Thoughtseize into Death’s Shadow is sure to put a dent in any kind of synergy players have cooking. “Focus” here means avoiding dilution, which explains why we’ve seen less-consistent combo decks (due to lack of workable pieces) like Grishoalbrand fall off the map. It also means not splashing extra colors when unnecessary. Consider the aforementioned Scapeshift deck that splashed black for Push and Brutality. 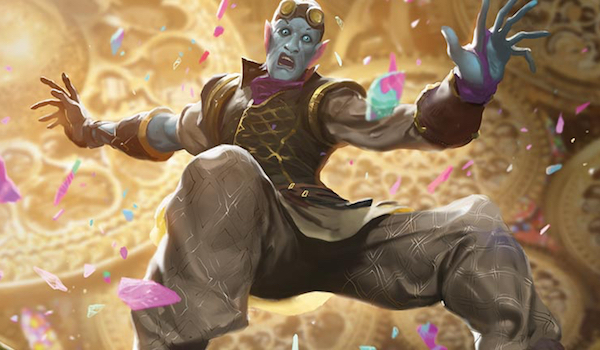 While those spells are definitely ones the deck wants, and play to the mid-game better than Bolt does, players have found dipping into a third color so perilous that the splash has largely been abandoned by now. Ah, the belle of the ball. For a time some weeks ago, just before Wizards slashed its released MTGO data, Push was actually the most-played removal spell in Modern. But the format has adapted and shifted to fight Death’s Shadow, and unlike during the yardstick-most-oppressive Modern format of Eldrazi Winter, the best way to beat it is actually not just to also play Death’s Shadow. It’s to play Path to Exile. Where does that leave Fatal Push? In terms of present representation, a few points beneath Lightning Bolt. But notably, Push sees play in fewer decks than either of those spells despite boasting a representation score just 5% below that of Lightning Bolt. The first reason is simple: Grixis Shadow still makes up a sizable portion of the metagame, even though Modern has shifted to attack it directly. For some, that indicates a fundamental (and perhaps bannable) problem with Shadow’s power level. But Shadow’s shares have decreased some, and I’m holding out for more major event results before also declaring it too strong for Modern—after all, the deck’s presence has done a lot of good for the format. The second reason is also simple, if we can stand to compare Push to Bolt yet another time. Just as Bolt was slotted into a myriad of decks for different reasons, Push finds itself in plenty of Tier 2 and 3 strategies by virtue of being excellent at a similar task. In fact, Push is better at stopping early beaters and breaking up blistering creature synergies than Bolt ever was, since it deals with the likes of Tarmogoyf scot-free and can even take out beefier threats like Kalitas, Traitor of Ghet with a little work. Those numbers add up and help Push claw its way past the 20% mark. Lastly, I think Push might actually be worth more than MTGGoldfish makes it out to be. Since Wizards stopped releasing so much uncurated MTGO data, we’ve had for our analyses a more fractured metagame picture than ever. With such a powerful deck in the format, it’s not just possible, but likely, that Grixis Shadow sees more play than is indicated by those miserly 5-0s. That predicament alone throws the whole thing off. Shadow has continued to do well at larger events; if my theory proves correct, we’ll see it continue that trend at SCG Syracuse this weekend. There are, of course, other removal spells in Modern. But Bolt, Path, and Push will remain the three most important for years to come. Let’s touch on the few other staples anyway. A clunkier Path to Exile, and often just a worse Push, Terminate isn’t the Modern icon it once was. Sees play mostly in Grixis Shadow as a way to kill delve threats, Titans, and co., but notably struggles in the face of Kitchen Finks, Voice of Resurgence, and Wurmcoil Engine. Similarly to Lightning Bolt, Collective Brutality is a utility spell at heart. It’s black’s go-to toughness-based kill spell, and can do more for the mana than anything else in Modern. I can see Terminate becoming more fringe in the future, but Brutality is going exactly nowhere, and should remain a sideboard staple and mainboard tech for as long as Modern remains a tempo-centric format. This one’s sort of a sleeper right now. Sol Malka ran the full 4 Decay in his aforementioned BG Rock deck alongside just 2 Fatal Push, and I think he’s on to something. Decay cracks ‘walkers like Liliana and Gideon as well as annoying lock pieces like Chalice and Bridge. It also can’t be countered while targeting a Shadow, which is currently huge. I think the main reason Decay doesn’t see more play is its color combination. There are simply too few interactive black-green decks right now to cause its representation to increase. Thanks mostly to Burn, Dismember has never seen much play in Modern. These days, many of the decks that might have wanted it simply have better options available to them. That leaves Dismember in a funky spot. Only decks without black, white, and often red, that are in the market for a kill spell, and that have lifepoints to spare, can pack the card. Of course, the colorless Eldrazi decks make great use of it, and I think it could see more play in Shadow decks—it’s terrific in the mirror, where it accelerates out your Shadows while killing your opponent’s and plays nice with Snapcaster Mage when it comes to filleting Gurmag Anglers. There are plenty of ways to kill a creature in Modern, which is great news from a health perspective. Since Push’s release, the reviled aggro-combo archetype has all but met its doom, giving way to its more interactive kin in Burn and Affinity. It’s probably no surprise that Bolt is my favorite way to say “die,” but there’s no accounting for taste. What’s yours? So why is so hard to find a good Mardu deck that uses Push, Bolt, and Path backed up by Bob, Souls, and other Jund-style cards? Which part of this article made you think I believed otherwise? It’s definitely a legitimate discussion, I just don’t think we have enough data yet to make that claim categorically, as some writers have (i.e. Ross Merriam). Bolt is bad against Shadow decks not because of just Shadow but also because of Tasigur and Gurmag Angler. Every creature except Snappy passes the bolt and the push test. Bolt does more than just remove creatures. Hold off on attacking Shadow decks and they will put themselves within range of three Bolts just so they can save their namesake threat from it. It also kills ‘walkers, and shooting Snapcaster is no joke in a lot of game states. I agree it’s not the “best card ever” in this matchup, but it’s certainly passable against Shadow and therefore in this metagame, which I think is a lot more than people have been giving it credit for. I was wondering to what extent push has slowed modern down and made five mana a relevant cmc. We certainly arent seeing thragtusks and baneslayers everywhere, but tasigur angler and the bigger eldrazi have never looked better. The cards most crushed by push seem to be infects creatures (even poor old secret tech phyrexian crusader) and tarmogoyf/ooze – who are getting squeezed by an uptick in relic and rip to combat delve dudes and living end and snapcaster (I surmise). Games certainly seem slower across the board in modern. It is absolutely nothing like the period of dredge, affinity, burn, and infect hegemony. This is a great question and something to watch for. But I don’t think we’re quite at the stage where 5 CMC is playable in regular midrange decks. The 5+-CMC threats that do see play do so in decks that either make them cost 4 mana (via Temple, which is likely to be found by turn 4), big mana decks (Valakut, Tron), or the most dedicated of control decks (UW, which plays 1-2 Gideon Jura). Dismember, Path, and Terminate are still cards, which makes the bar almost impossibly high for creatures that cost a turn’s worth of mana in the mid-game. And besides, why play a midrange deck with enough lands to get to 5 mana when you could play Shadow, which has higher velocity, reversibility, and more as well as a namesake threat with a high payoff than that of most 5-drops in the first place? Affinity’s continued success seems to indicate that overwhelming Push is a much stronger strategy than trying to dodge it with expensive creatures. Alternatively, finding ways to play high-costed beaters early has a lot of traction—the delve threats have seen increased play for their resiliency to Push, and the GR Vengevine deck from the open focuses on accelerating into Hollowed One (as well as Hooting Mandrills!). The closest to a playable 5-drop we have in Modern is Lingering Souls, which has indeed become better with the format’s slowing. Of course, that’s not a “true” 5-drop, either. Verdict: Modern has certainly slowed down, but the format’s harsh conditions still require creatures to maintain some semblance of efficiency. Does the revolt requirement factor in to playability at all? Guessing not – your resto angel is pretty much just as likely to be pushed as your birds of paradise, although flash always has the upside of coming in when theres no obvious way for them to get revolt up and then getting at least one turn of value. In that article, I predicted that two-drops, which unequivocally fail the Push test, stand to lose the most from the card entering Modern. I’ve been vindicated, too; Goyf is now the 17th most-played creature on goldfish, appearing in fewer than 7% of all Modern decks. Three-drops actually improve with Push around, specifically those that die to Lightning Bolt, a card Push has all but replaced. That’s why we’re seeing stuff like Spell Queller so much. Four-drops require revolt, making them as difficult to Push as three-drops, but the sheer amount of tempo you lose by having your four-drop killed for one mana is so massive that it does not matter whether your opponent needs to wait a turn to figure out revolt. They’re in the same boat as two-drops here, if not in a sinkier one.